This wall mounted folding shower seat is simple and well-priced but very functional. 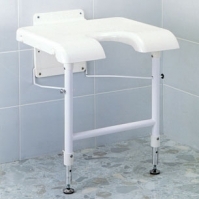 The legs are adjustable in height so the seat can be mounted at the perfect height, and the frame is epoxy coated for aluminium for corrosion resistance. When the seat is not in use, the legs and seat fold back flat against the wall. There is also a cut-out gap at the front to assist with personal cleansing and reduce the need to move around whilst in the shower.